Small one bedroom cabin available on a private semi-secluded road. 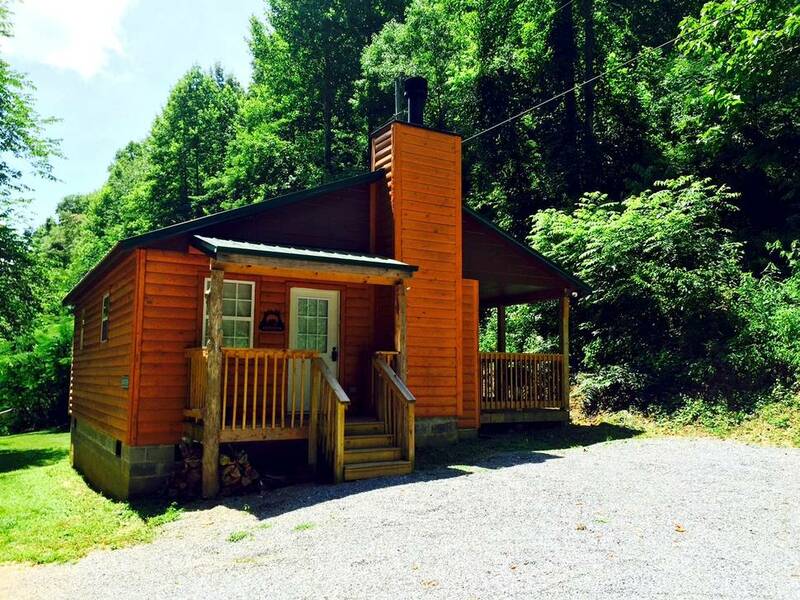 Simple but cozy cabin includes all of the amenities you could want on your vacation or weekend getaway. Makes a great place to stay for any couple looking for some rest and relaxation in the Great Smoky Mountains. Bear's Den includes a fully equipped kitchen so that you can cook a simple breakfast or romanctic dinner for that special someone. The bath room includes a stand up shower & vanity, The living area has a comfy sofa, coffee table and flat screen TV with satellite TV and DVD player. The cabin also includes free wireless internet so that you can keep up with home if you would like to. There is a king sized memory foam bed in this cabin so that you can enjoy a long nights sleep and wake up refreshed and ready to conquer the world. Outside you will find a covered hot tub and deck with rocking chairs. Great for that morning coffe or just sitting out in nature and ready a good book. There is also a BBQ grill for you to use. Come and enjoy the simplicity of Bear's Den. Give us a call now at 865-980-0082. Was great clean cabin loved it. Perfect! Clean cabin decorated with a rustic feel with bears all over, very cozy. Perfect for privacy in the hot tub. Close enough to grocery store, restaurants and shopping. The bed, oh my the bed is perfect! Best sleep ever!!! This cabin lived up to all of my wishes. We didn't want to leave. We hope to return. We had a very nice time there. We loved the seclusion, but our cell service was spotty. We had it in some parts of the cabin, but not in others. There isn’t a dusk to dawn light, so you might want to bring a nightlight if you don’t like the dark. Very nice cabin. Had everything we needed while on our trip. Would stay here again. The cabin was very clean when we arrived and easy to find. The staff of Smoky Cabins were very friendly and helpful. They responded quickly to my emails. Reservation were easy to make without all those extra fees other places charge made the stay more affordable. Great location. Cabin was clean and comfortable. Perfect cabin for 2. Nice quiet setting. Really enjoyed ourselves and will be back!!! Loved it!! Everything was great! Had a great time!! Booking was easy and when we asked questions the response time was quick. The cabin was real nice and the cleaning crew did an excellent job preparing for my arrival.I would definitely stay again. had a great time at the cabin. only one glitch that was addressed reasonably quick, other than that very comfortable cabin . am seriously considering a return stay at the same place. The Bear's Den was exactly as described and we loved it. After one small email requesting that the shower head be fixed, it was awesome that it was fixed upon our return back to the cabin later that day. Would definitely rent from you again. Thank you. The cabin was just what we needed. It was clean and well taken care of. I really enjoyed staying here and will return! Extremely relaxing, Secluded although very convenient location. Very clean, cozy, and comfortable... had a wonderful romantic and relaxing weekend... We will definitely be returning to Bears Den. Very nice cabin. No noise but nature we enjoyed ourselves. Beautiful cabin VERY clean and had everything we needed. Tucked away just the way we wanted it. We will definitely be back. It was our honeymoon and it was the best! This Cabin had just enough space for me and the husband. Quite area too!! We will definitely be coming back!